One of the best and by far the most popular day tour when travelling to Iceland is The Golden Circle, and for a good reason. There are not a lot of places in the world where you can check out a rift valley, a massive waterfall and an erupting geyser, and still be back in town for happy hour. 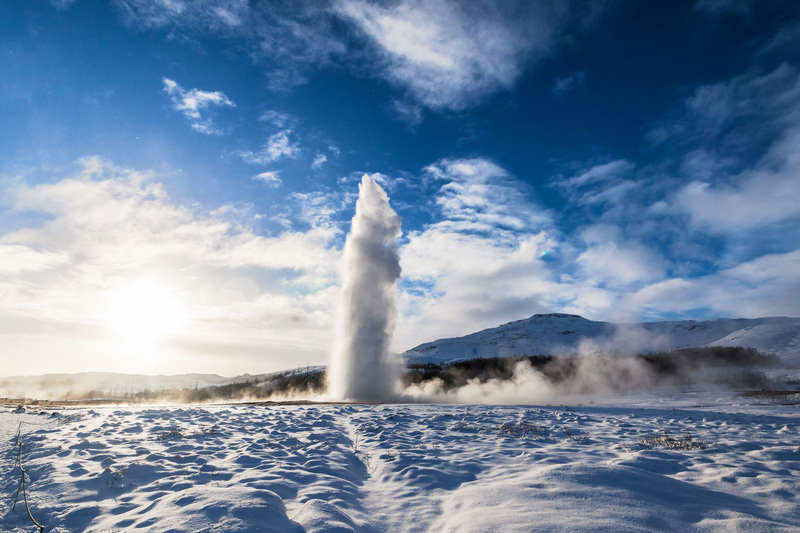 The pillars of the tour are Þingvellir, Gullfoss and Geysir, but there are of course numerous add ons that can easily be made with all the sights and activities available on and around the classic route. Starting out over Hellisheiði it´s a great idea to make a stop at the geothermal power plant Hellisheiðarvirkjun which is a world class example of green energy production supplying a large percentage of Reykjavik´s power. The simple version is: imagine a colossal kettle that keeps on boiling forever moving the gigantic turbines… well, maybe just take the bus tour. The next town is Hveragerði (Hot Spring Meadow) which has so many hot springs within the town limits that they had to relocate the cemetery after some unfortunate events involving an earthquake and increased underground heat. The town is also the cradle of the greenhouse industry (no relation to the greenhouse effects) in Iceland which makes the country around 60% self-sufficient in vegetable production despite the climate. One of the best private mineral collections in Iceland is on display at the N1 gas station across the street from the Bonus supermarket, Almar bakery and the liquor store. Moving on from Hveragerði along the main road be sure to turn left before hitting Selfoss and keep going up road 35 which leads all the way to Geysir and Gullfoss waterfall. On the way it is well worth stopping at Kerið crater and paying the small fee to explore a bit since, let´s face it how many times can you park next to a massive volcanic crater and have actual stairs to take down and up. Further up the road you can find Friðheimar, the largest producer of organic tomatoes in Iceland and thus, also serve a lovely tomato soup and possibly the best Bloody Mary in the world. 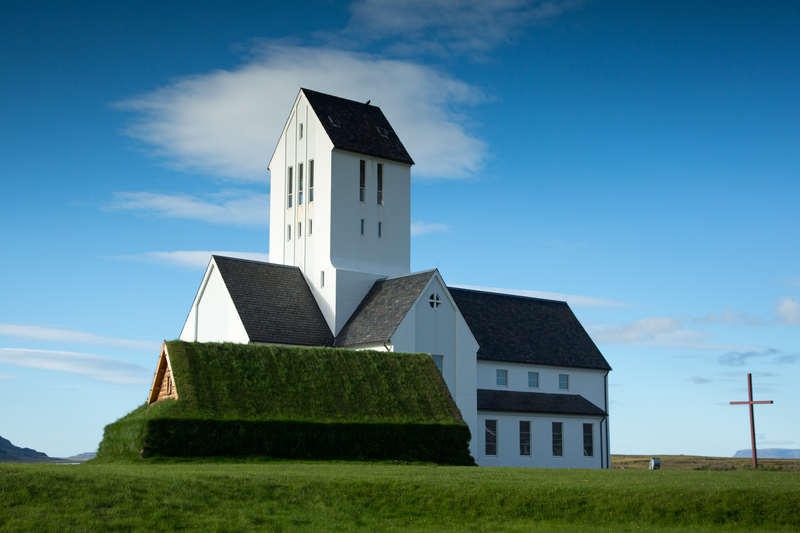 Also, be on the lookout for Skálholt church if you are into a bit of history and archeology, the old bishopery of Iceland sporting an actual sarcophagus in the basement. And just before reaching the Geysir hot spring area be on the lookout for Faxi, a great little waterfall if you can find it, complete with a fish ladder and everything. These are great ideas for places to stop along the golden circle iceland. Geysir, once the only erupting hot spring in Europe and from where the word “geyser” originates, does not erupt anymore. Strokkur, right next to old Geysir, however does so, and pretty much every 5 minutes, 24/7, 365 days a year. Whether it is waiting for the next gush of steaming hot water to explode from the ground, or watching others trying to have their cameras ready for the moment, this place is a must. Opposite of the geysir geothermal area you find a hotel and the chance to grab something to eat. Only ten minutes further on is Gullfoss the largest two-stepped waterfall in Iceland situated in hvítá river flowing from Langjökull glacier. If this place does not move you in some way it is doubtful that you should be travelling the world at all, or at least you should get your eyes checked. An absolutely magnificent flow of white water tumbling roaringly into the great gorge, rainbows in the spray above and ice sculptures to the sides. Next to Gullfoss waterfall is the road up to the snowmobile action on the glacier for those who want to go all the way. It takes roughly an hour to drive from Gullfoss to Þingvellir. Stops that can be made along the way include the dairy farm at Efsti-Dalur, the geothermal baths in Laugarvatn and the Laugarvatnshellar caves on Lyngdalsheiði. 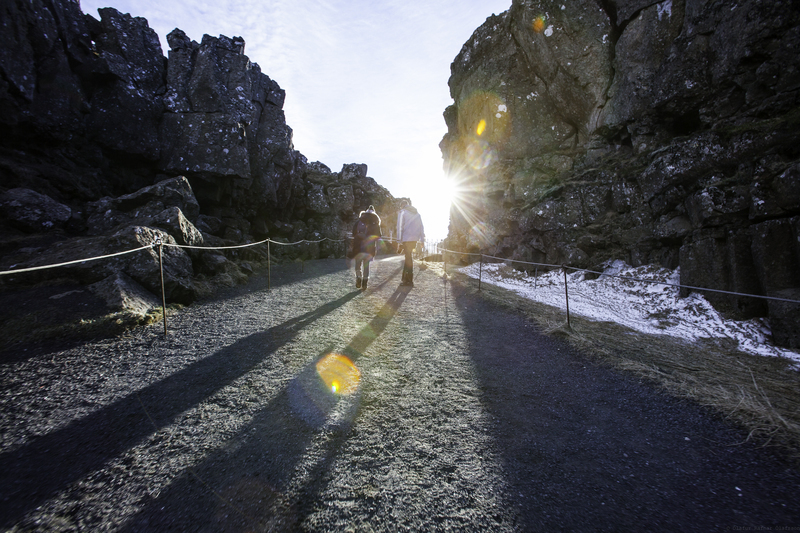 Þingvellir national park and rift valley is both geologically and historically an important and impressive place. This is one of the few places where you can actually clearly make out the edges of the american and eurasian tectonic plates moving ever so slowly apart, 2-3 cm per year, although the valley is around 7 km wide. The valley floor is ripped by fissures and small canyons overgrown with moss and other vegetation, this landscape in fact inspired Icelandic artist Jóhannes Kjarval to create his own school of abstract painting. The lake is one of the largest in Iceland, its crystal clear waters making it an international destination for divers, and it is also home to a particular species of arctic char that got landlocked here at the end of last ice age. This is also where the first settlers formed their council or parliament in 930 ad, creating a platform that enabled the old vikings to live together under a general law very much resembling a democracy. This is definitely something for those craving more history. On the way to Reykjavik through Mosfellsdalur it would be a good idea to stop by Gljúfrasteinn former home of and now a museum dedicated to the life of novelist, playwright, poet and essayist Halldór Laxness who was awarded the Nobel Prize in literature in 1955. Also, this valley, was the last home of the great viking warrior poet Egill Skallagrímsson amongst whose greatest hits include puking into a mans face before killing him and writing a poem so impressive that Erik Bloodaxe of York who had previously sentenced Egill to death decided not only to spare his life but award him with a silver treasure and a ship. Ladies and gentlemen, enjoy the Golden Circle.